The photography model has been finished for the new Blanket Chest that Klockit will be introducing as a plan product later in 2013. The chest design favors the Arts & Crafts styling, and is very compatible with other furniture plans in Klockit’s Prairie Series. The model is made of red oak with a rich dark stain, made of a 50/50 mixture of Minwax red oak and dark walnut penetrating oil stain. The 48” length x 20” top is center split and slides open to for access to the storage chest. This blanket chest is unique in styling and versatile in usage. I thoroughly enjoyed building the model. As with all of Klockit’s plans, I found the individual wood parts construction drawings and the illustrated assembly drawings easy to follow. Plus, the drawings are backed up with additional written instructions, very complete. 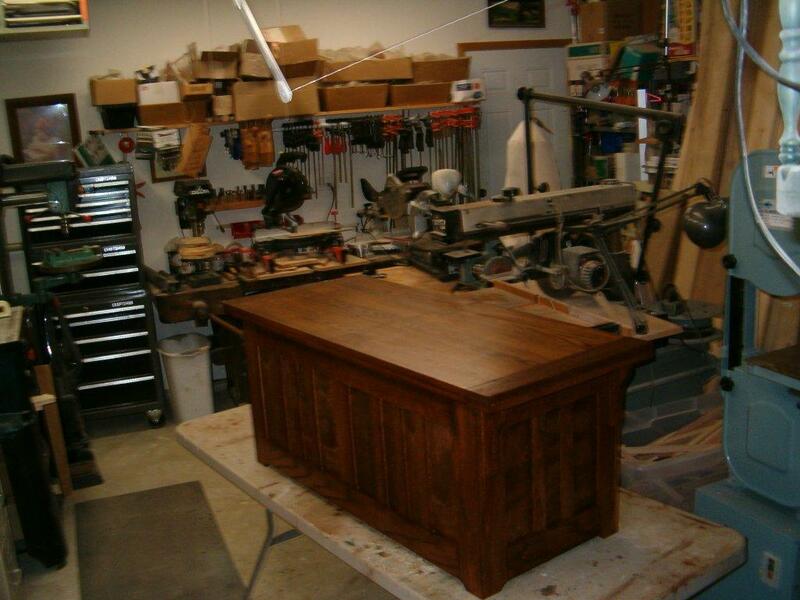 I am confident this blanket chest design will be well received by Klockit’s woodworking customers – and that they will get numerous requests from their wives, daughters, daughter-in-laws , sisters, and sister-in-laws to build the chest for them too. I know I already have! It’s great because it can be used for blanket/quilt storage, as a hope chests, toy box, and even a coffee table. Some want the chest made of oak and stained, like the model, but others have requested that I make the chest of pine or poplar so they can paint it. Be on the lookout for the blanket chest plan in Fall 2013! That chest is perfect a lot of people like that. You could use that as coffee table also. My daughter would love that in her house today.I would like to have one and a grandfather clock (kit). Thank you for your kind words, John. This chest has gotten great feedback so far. Our team also designed a coffee table like this (same sliding feature, different dimensions). What style grandfather clock would you like to have?